There is a disturbing trend, gentle readers. One that quite upsets your MatchGirl. There is a trend that employers, people who are hiring, are saying that the long-term unemployed, those who need the jobs the most, need not apply. Your MatchGirl, who, herself, was among the long-term unemployed, before landing her current spot, has some thoughts on this. Bear with me. The employers want people who still are up-to-date and current on all that applies to their posted position. They want people who have been in the working world and have networks and contacts to rely on. They want people they won't have to spend money to train - ones that can slip easily into the position. 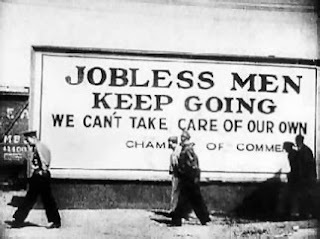 The long-term unemployed are eager, no desperate, to work. They are at the end of their financial rope. They will take jobs they are over-qualified for. Once 9 to 5 office workers will happily sweep floors. Scientists will become cheesemongers. These people have no income to speak of and they need this job. The economy needs for them to have it. Your MatchGirl, gentle readers, see the problem as this: The employers are not educated about the state of the unemployed person today. The average unemployed, much as I did when I was unemployed, is putting themselves out there as much as possible. They are educating themselves, in classes or online or through friends, on anything they think will be able to help them get a job. They want to get hired and they want to be ready when that finally happens. Make sure to add anything you have been doing to your resume. Volunteered two days a week at a shelter? Add it! Take classes at a community college? Add it! Babysit on a regular/semi-regular basis? You're a nanny. Add it! Prove to the employers that unemployeds are not lazy. And that they deserve, at least, a chance a that posted job.